It took me a long time to, er, come around to the logic and efficacy (at least in safety terms) of the Jersey Jughandle, but following a prompt from Anthony Townsend, do any NJ DOT readers or likewise know how the Garden State came to be the leader in this somewhat rare infrastructural form? Taking a stab I’d say it had something to do with the state’s density and preponderance of highways, but can anyone elucidate us beyond that; e.g., the name of the inventor, etc. Comments Off on On the Origins of the Jersey Jughandle. Click here to leave a comment. 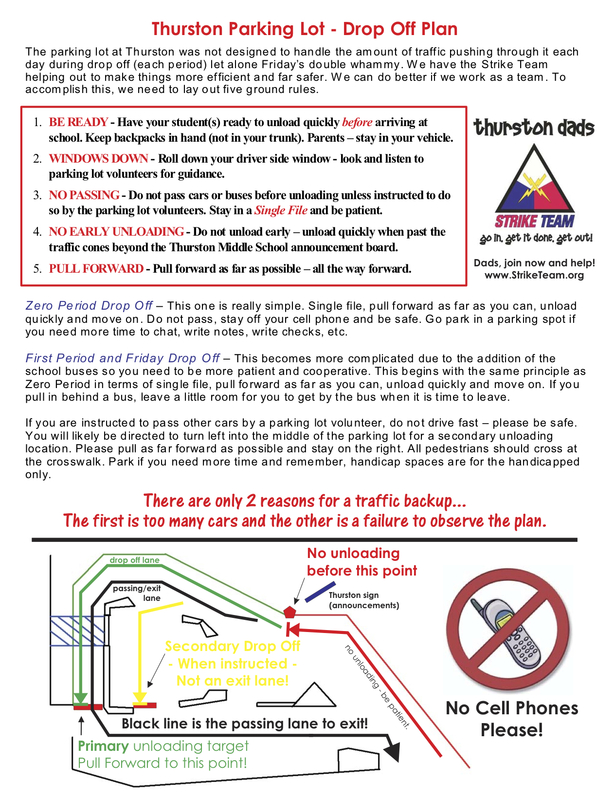 Via a discussion at the NRDC Switchboard about a school in Orange County that does not allow students on foot, I was struck by the school’s amazing “Strike Team” document, pictured above, covering the ins-and-outs of the school drop-off. Comments Off on The Logistics of the School Drop-Off. Click here to leave a comment. Dusting off an old feature here, we look at NYC’s new campaign to remind drivers of one the city’s biggest secrets: It’s 30 mph citywide limit. Can Multi-Use Paths Be Shared Safely? I was essentially asked this question recently in reference to a tragic case of a jogger killed by a cyclist in Dallas. Based on some nastiness I’ve experienced on the Brooklyn Bridge, along the Hudson River — and even hearing stories about how people’s enthusiasm for the NYC DOT’s “Summer Streets” program was dampened by inappropriate speed choice of cyclists through the event — I myself have had doubts over this, and I’m wondering what experiences people have had around the country, what remedies they’ve seen, etc. How’s the sharing going on the new Walkway over the Hudson going, for example? I know people will answer courtesy, common sense, etc. (as well as not listening to loud music w/ear buds while cycling/running), but are there engineering/design strategies that have been used, particularly at crossings and the like? Should fast-moving cyclists (I don’t know the velocity involved in Dallas) simply stick to the road, even when it’s a less than desirable situation? This is not to say that the real source of pedestrian or cyclist danger is on multi-use paths, and some of the failings of multi-use paths is that they’re simply too small — the majority of room having been given over to the car. But just wondering about ideas. Comments Off on Can Multi-Use Paths Be Shared Safely?. Click here to leave a comment. Comments Off on Roundaboutgate in Winnipeg. Click here to leave a comment. Reading an enthusiastic account of bicycling in New York City from this 1879 (!) 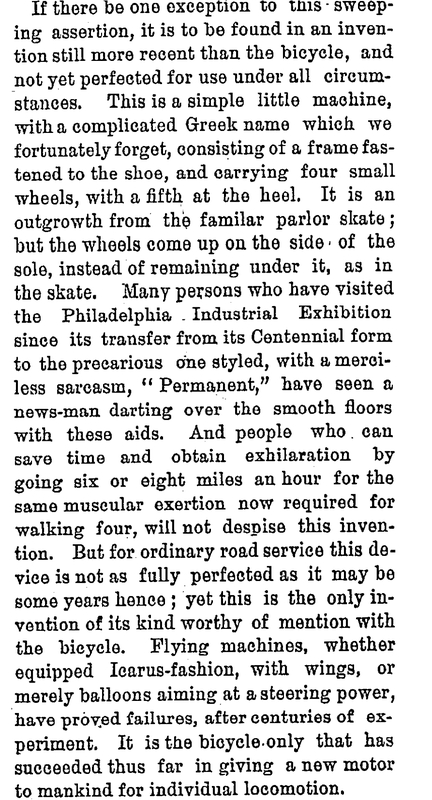 article from the New York Times, I was curious about the reference to the sort of wonder skate referred to as a possible rival to the personal rapid transit offered by the bike. It almost sounds like a proto-roller blade. Anyone know what this is, have any references, etc.? Comments Off on ‘A New Motor to Mankind for Individual Locomotion’. Click here to leave a comment. High-speed driver in Israel arrested via Facebook evidence. I wonder if the statute of limitations has run out on Claude Lelouch, whose famous ride is below. Comments Off on Status Update: Busted. Click here to leave a comment. Comments Off on The Speed Camera Lottery. Click here to leave a comment.